The Ultra Low Cost Carrier - ULCC - business model is well beyond its infancy in the US, but passengers are still bemused by the concept of a totally unbundled air travel experience. Some ultra low-cost airlines acknowledge that perhaps one of the greatest challenges that lies ahead is educating customers about their different product offering. CAPA's recent Americas Aviation Summit in Las Vegas hosted a discussion between some of the leading proponents. At the same time there is one school of thought that the three large US airlines – American, Delta and United – could be ceding domestic travellers to the lower cost airlines. However, recent moves taken by those airlines show that they may not be willing to allow ULCCs to have total control over the cost-conscious air traveller segment. As all US airlines settle firmly into their respective business models, the reach of ULCCs in the present market place is difficult to measure. 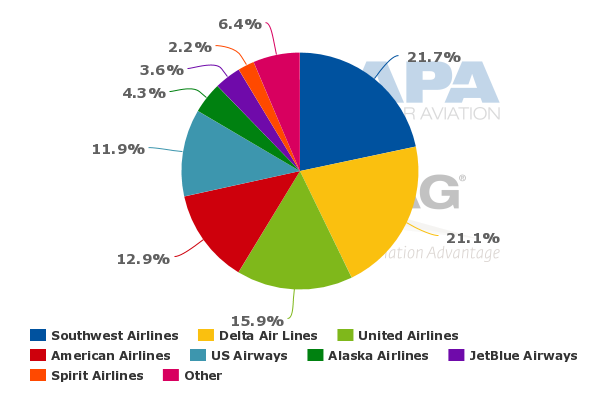 But one certainty is that those airlines remain ambitious, and plan to increase their stature in the mature US market. Many airports also see opportunities. 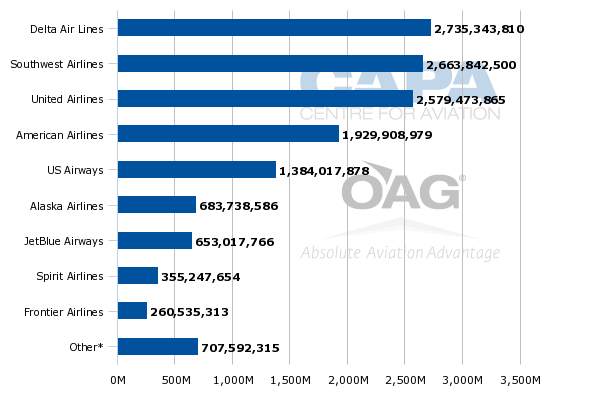 Allegiant, Frontier and Spirit are the leading ULCCs operating in the US. Allegiant has a low-frequency model that links smaller cities such as Casper, Wyoming to Las Vegas, Orlando Sanford, Tampa and Punta Gorda. Frontier and Spirit operate more traditional service patterns in larger markets where they believe some customers have been priced out of air travel. Spirit’s long-held view is that it can co-exist with legacy airlines in markets such as Dallas/Fort Worth or Chicago since it is targeting a low-yielding passenger segment that is no longer relevant to larger network airlines. Even though Spirit has been executing the ULCC model since 2006, in the early days after its ULCC transition it targeted cost conscious customers travelling to the Caribbean and Latin America from its largest base in Fort Lauderdale. During the 2010-2011 time period Spirit shifted its attention to the US domestic market, building up a presence in US major airline hub markets including Dallas/Fort Worth and Houston and other large markets such as Las Vegas. Despite rapid capacity growth during the last couple of years – 24.3% in 2013, 18.9% in 2014 and a projected jump of nearly 31% in 2015 – Spirit’s overall presence in the domestic market remains small. Data from CAPA and OAG show that for the week of 4-May-2015 to 10-May-2015 Spirit represents just 2.5% of domestic US ASMs and 2.2% of domestic US seats. Frontier has an even smaller presence, with its domestic ASMs for the week of 4-May-2015 to 10-May 2015 representing just a fraction of Delta’s ASM production. Even as both Frontier and Spirit represent a small portion of the US domestic market, ULCCs are poised to be at least a disruptive force. Indigo Partners, which was a major shareholder of Spirit before acquiring Frontier in late 2013, believes that distinct customer segmentation exists in the US market place. Company co-founder and managing director William Franke during the recent CAPA Americas Aviation Summit in Las Vegas concluded JetBlue, Virgin America and to some extent Southwest have cost structure above Allegiant, Spirit and Frontier. The major US global airlines are at the top, and those airlines manage against a pricing structure that meets the needs of their cost requirements, he believed. Mr Franke concluded the key to successful execution of the ultra low-cost mode in the US is a unit cost excluding fuel of under USD6 cents. He believes if costs remain in line and efficiency is favourable, then the ULCC concept is a “very attractive model to the travelling public”. Although Frontier has made a lot of progress in its transition to an ultra low-cost model, Mr Franke told conference attendees that roughly 14 months after the purchase by Indigo, “there is still more to do”. He told CAPA separately that at the time of the acquisition by Indigo, Frontier’s unit costs excluding fuel were roughly USD7.7 cents. Mr Franke stated that the three largest US network airlines are conceding the domestic market to the lower cost model, and he thinks that will continue. But both American and Delta have either expressed sentiments or taken action that runs contrary to that logic. Delta in late 2014 rebranded its fare categories whose lowest tier is targeted to the highly cost conscious consumer. Tickets are non-refundable, itinerary changes are prohibited and seat selection is unavailable. Both Frontier and Spirit are making a push from Delta’s Atlanta hub in 2015, and Spirit has long been a competitor of Delta in its Detroit hub, where Spirit has its origins. American Airlines president Scott Kirby has deemed Spirit a “real competitor”, and has stated the ULCC does well. He also remarked that American keeps a watchful eye on the ULCC. Spirit during 4Q2014 estimated that it had roughly 58% overlap with Spirit. General sentiments that ULCCs are immune from pricing pressure has been uprooted in 2015 as falling oil prices have triggered price compression in some markets. Spirit estimated that pricing pressure accounted for roughly 35% of the 9.9% drop in total revenue per ASM during 1Q2015. As oil prices started to fall in late 2014, Spirit warned of pricing compression in 4Q2014, and since facing those challenges the airline has maintained that it manages its business to operating margin. At the end of 1Q2015 Spirit projected a highly respectable operating margin of 24% to 27% for 2014. Spirit CEO Ben Baldanza recently reiterate that the airline ultimately focuses on operating margin, "and we believe that our high margin performance during a period when our base fares decline validates that". Spirit’s average ticket revenue per flight segment fell 11.7% in 1Q2015 to USD68.7. The airline’s operating margin increased 900 basis points year-on-year to 22.7%. Since its IPO in 2011 Spirit Airlines has turned a stellar performance, and its margin growth during a time of pricing pressure shows some staying power of the ULCC model. Obviously lower fuel costs play a large part in margin expansion, but Spirit during 1Q2015 maintained the USD6 cent unit cost ex-fuel performance that Mr Franke believes is key to ULCC success in the US market place. 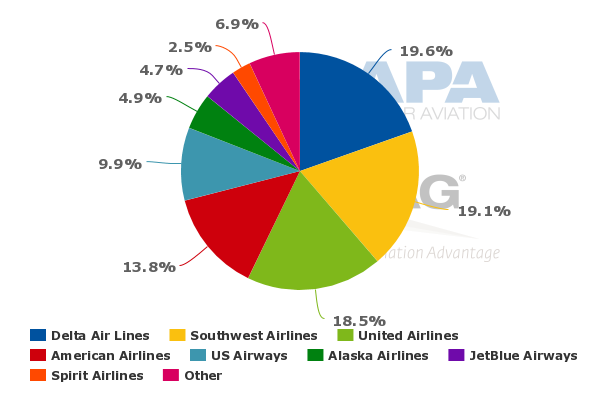 Southwest, which is increasingly lumped into the mid-level cost pack with JetBlue and Virgin America, maintains on a stage-length adjusted basis that its unit costs are flat compared with Frontier, said SVP of of network and revenue management Andrew Watterson to CAPA Americas Aviation Summit attendees. He also concluded on a seat mile adjusted basis that Southwest’s costs are below JetBlue and Virgin America. Among Spirit, Allegiant, JetBlue and Virgin America, Southwest has the lowest average stage length of 739 miles (1,189km). Generally, the higher the aircraft stage length, the lower an airline’s unit costs. Mr Watterson stated that passengers “who want to fly in a lie-flat seat with a box of potpourri” are a very small segment, as is the market segment that does not mind checking bags, having a carry-on bag, changing their tickets or paying for water “and not get good service”. Between those guardrails, said Mr Watterson, is where a large swathe of the travelling public resides and “where Southwest resonates”. Indigo’s Mr Franke noted that one issue for ULCCs is educating the public about unbundled products. “To be candid, I think we’ve done a pretty poor job of that,” he stated. The result is customers are happy with the lower fares, “but they don’t get this idea of bundling the fare”. Spirit last year developed a new advertising campaign that aims to educate passengers about its product, and how to navigate travelling on the airline. After Indigo acquired Frontier, Mr Franke stated the ULCC model was tweaked a bit, and Frontier offers both bundled and unbundled fares. The bundled fares are priced higher and include refundable tickets, stretch seating, one free checked bag and one carry-on bag. Mr Franke noted it was interesting that so far the travelling public prefers the unbundled fare. With 30% capacity growth planned for 2015 and high expansion projected for the foreseeable future, Spirit’s stature in the US market place will rise during the next few years, which means its encounters with US major network airlines are set to rise. The response by the mega airlines for now is measured, but could intensify if they decide the cost conscious segment is not worth ceding to ULCCs. The overlap between Frontier and Spirit is also increasing, and as competition heightens between those two airlines, the market will show if the US can support two ULCCs. Southwest, meanwhile, continues to drive home the message that it is the original and perhaps the only LCC, and remains in a class by itself. How the ULCCs will ultimately change the US market place remains one of the most intriguing developments in a post-consolidation environment. They will no doubt provide some level of disruption; how intense that disruption becomes will be a factor of customer acceptance, maintaining lower costs and - inevitably - how competitive the majors see the threat posed and how effectively they respond.